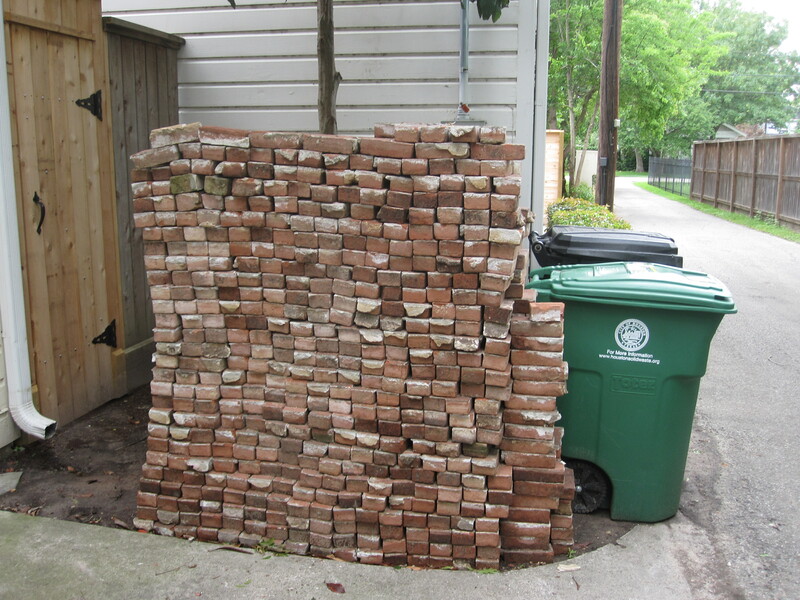 Reclaiming bricks…using materials that are already there! 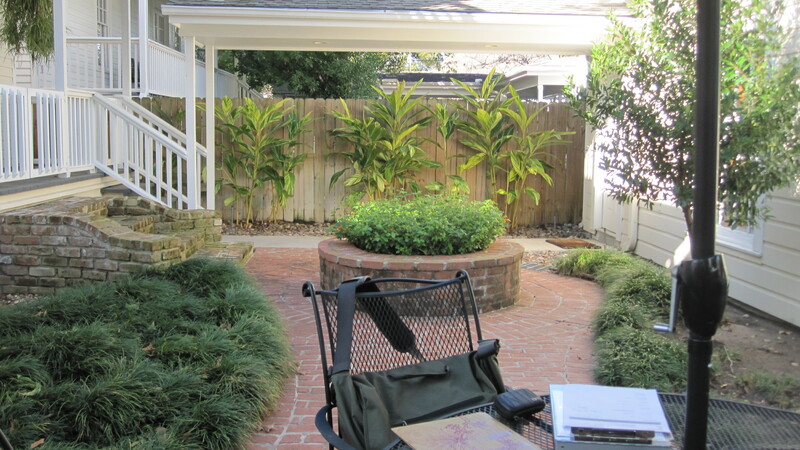 When we come into a yard for the first time I start by mentally inventorying what is there that is worth keeping, whether it is plants or hardscape materials. In the project we just started there was quite a bit of flagstone laying on the ground but not really installed properly and a brick patio that was very lumpy along with a large brick planter that the homeowners didn’t like. It took a couple of guys all week to reclaim these materials. Bricks we are going to salvage and reuse. Breaking the bricks out is tedious work. It will be worth the effort once we work them into our new patio design. Here is the planter which takes up a lot of space and to the left is an old brick stair that goes to nowhere. 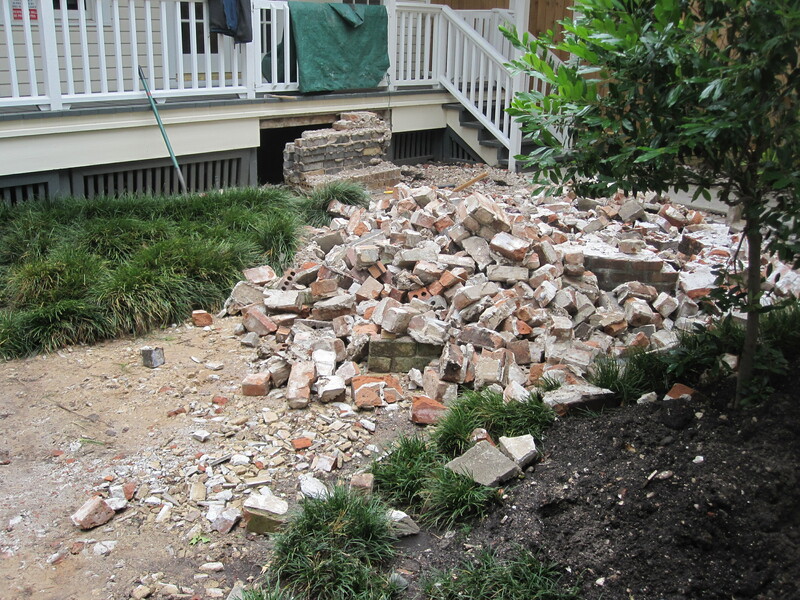 As they broke down the planter the lower bricks began to crumble. 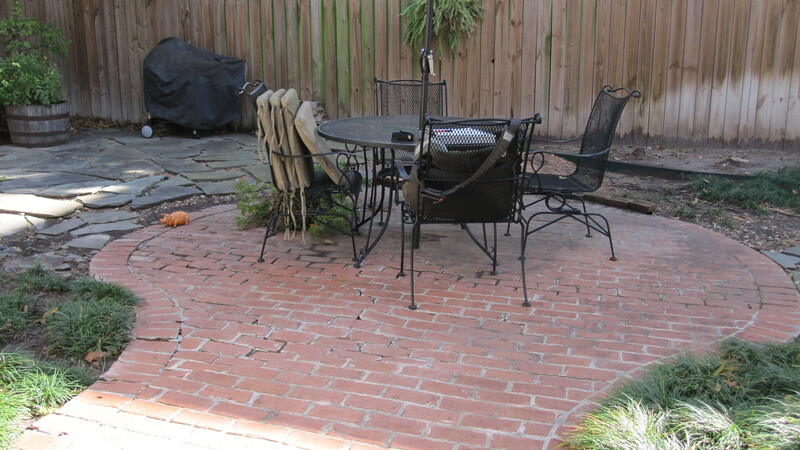 We will match the flagstone with additional stone and set it on a crushed concrete base and mortar it in. The bricks will be used for the edging. 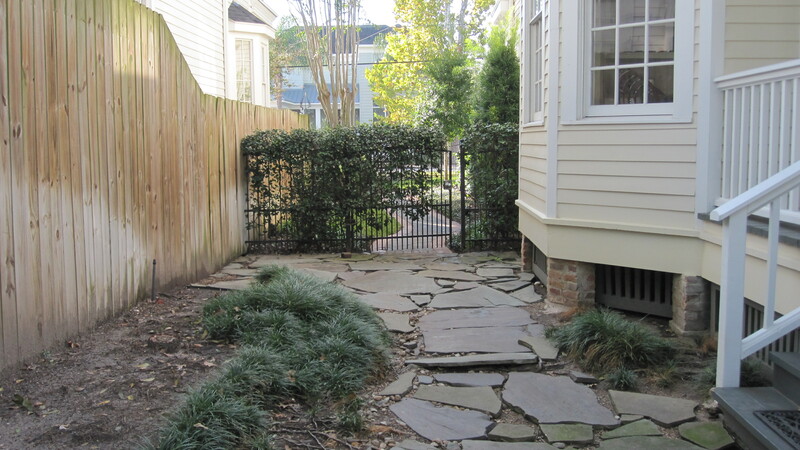 The contrast of the red bricks with the blue-gray flagstone will be striking. 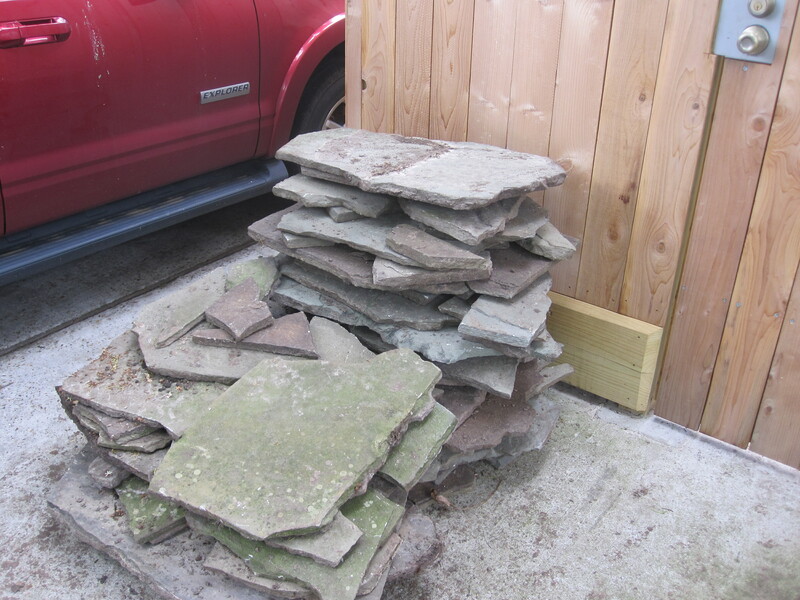 One pile of flagstone we salvaged. The guys did a great job of cleaning the bricks. Once all the materials were cleaned and stacked they began to excavate the dirt. Getting the patio level and with a slight grade towards where we want it to drain is very important. We had to take out quite a bit of dirt so we had room for the crushed concrete base. We will be working on that this week. Oh, I just love your project posts. I am looking forward to seeing the conclusion. It has taken me years to understand my tiny landscape but it seems like you can just wander into a space and know exactly what needs to be done. I admire that. And maybe expertise with that imagination. I am such a noob at this stuff. I was even oblivious to how even something like the passage of the seasons affects light. I have one spot in the yard that is in blazing sun all winter; part shade in the spring and total shade in the summer. When I first moved here I saw that space only in the winter and decided it would be a perfect place for a rose. I could not have been more wrong. Do you eventually get a feel for spotting microclimates? I think it must be really tricky if you are always working with new spaces. Debra, gardening is a life long journey of discovery! We all make mistakes and have failures. In days past gardeners kept journals so they could remember how things were year in and year out. And gardeners move plants when they don’t do well in a place. Getting a feel for your patch of earth does take time. I don’t have that luxury when I work in other peoples gardens. I do take lots of picture, take a compass reading and note the structures and trees that surround it. I have a garden on one side of my house that is very shady except in spring…I sort of hold my breath hoping it doesn’t get too hot and burn the shade loving plants that live there. I love days like today that are over cast and threatening rain : ) I have seen people actually put up umbrellas and little shade cloths for plants but I am not that ambitious. The main thing is to let yourself play and borrow ideas from others….enjoy the journey!